The public prosecutors of the tribunal demanded prison sentences up to 25 years. But the three kept pleading not guilty and the judge considered there was not enough evidence to convict them. In his hometown, Glogjani, his family gathered in their living room to watch the verdict live on TV. The room was decorated with the Albanian flag and some pictures of their sons. The family was visible nervous. His father stoical sat in his chair waiting for what was to come, nervously smoking cigarettes, not knowing what to expect. When the judge spoke the words “not guilty” a loud shout of joy filled the room. Family members were congratulating each other and the press plunged the family. Outside the house people were shooting in the air with their pistols and AK-47s. After the verdict, the family moved into the courtyard, where the father of Ramush emotionally spoke to his son on the phone. In the centre of Glogjani, festivities started soon after Haradinaj was acquitted. Cars were horning, people were shooting in the air and teenagers were dancing, shouting, laughing and celebrating. A van stops in the middle of the street, a man steps out and starts beating the drum which immediately draws the attention of the crowd who join him. People clearly expected that he was found not guilty, since a numerous amount of people were wearing T-shirts with his face on accompanied by the text “welcome home”. The scene reminds to the declaration of independence two months ago. And not only in his hometown Glogjani people celebrated his release, also in the capital Pristina and other places around Kosovo. The Kosovar newspaper Gazeta Express opened this morning with a catchy headline: JACKPOT, showing a slot machine with the fruit replaced by the new Kosovar flag, the NATO symbol and a photo of Haradinaj. Pointing out how fortunate Kosovo has been recently in the last months: they got their independence, Albania will join the NATO and now finally Haradinaj was found not guilty. When Milosevic dismantled Kosovo’s autonomy in 1989 that was earlier given by Tito in 1974, Albanians in Kosovo were systematically made redundant. The KLA started its armed resistance in the mid-nineties. Ramush Haradinaj set up his own militia to fight the Serbs, the Black Eagles. The tribunal kept this militia, that was part of the KLA, responsible for murdering and chasing away Serbs, Roma and Albanian ‘collaborators’. Former Kosovar prime-minister Ramush Haradinaj arrives in Pristina the day after he was found not guilty on war crimes and crimes against humanity. 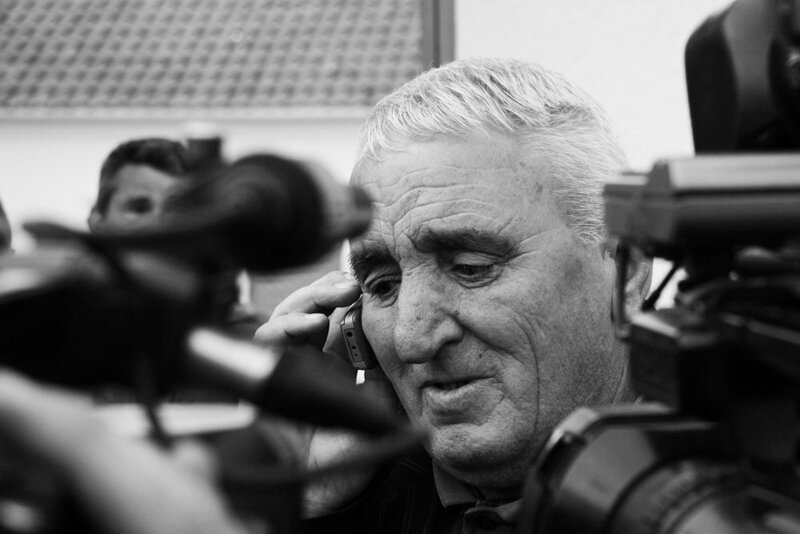 The father of Ramush Haradinaj speaks to his son minutes after he was found not guilty on war crimes and crimes against humanity.